Despite creating loads of chances in their first game against Tunisia, England had to rely on an epic stoppage-time winner from Harry Kane to get all three points. There was no such drama necessary in the Three Lions’ match against Panama on Sunday, however, as the English were actually able to finish their opportunities, and earn rewards for their impressive offensive play. It was already 5-0 to the Queen’s men at halftime, with a leisurely final 45 minutes ending in a 6-1 victory. Harry Kane lucked into a hat trick with two penalties and a deflection to give himself five goals on the tournament already. And defenseman John Stones was a pleasant surprise, picking up a brace with his head after a memorably uncoordinated effort to score with his feet against Tunisia. None were better, though, than Manchester United’s Jesse Lingard’s absolute cracker of a goal, placed perfectly into the top corner with his right foot. Panama gave a respectable fight, at least for one of the most overmatched teams at the World Cup, and they deserved to celebrate their first-ever World Cup goal at the end. 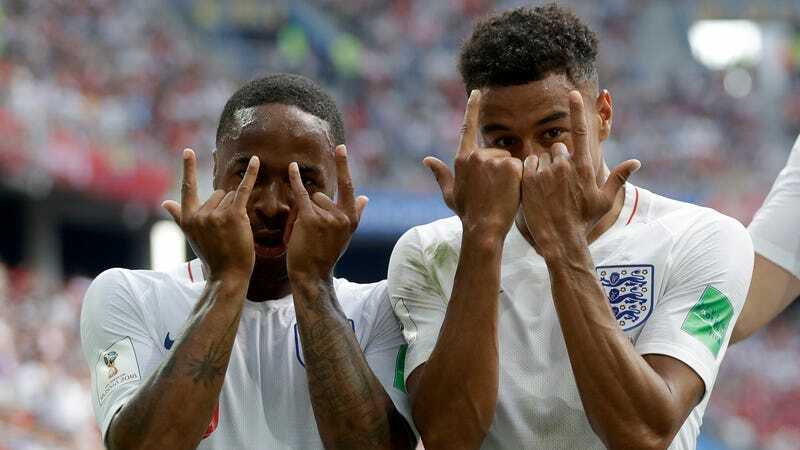 But England got to take whatever they wanted in this match, and that’s not something we’ve been able to say about the Three Lions at a major tournament in a long while. This win already guarantees the English a spot in the Round of 16, which they missed in 2014. But they’ll actually face a real, important test in their last group stage game against Belgium, who’ll provide an important measuring stick for the team’s level of fraudulence.